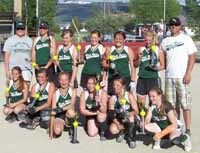 The Power Engineers-sponsored U-14 softball girls won the June 24-25 Top of the Tetons tournament with a dominating 15-4 victory in the championship game over Teton Terrors. Hailey girls, bottom row, from left, Kenzie Sigglin, Ciceley Peavey, Blair Radford, Lacy Harrington, Valeria Morse and Bailey Rierden. Top row, from left, coach Raeghen Peavey, Sadie Dawson, Chloe Evans, Haley Cutler, Aly Herich, Brittney Bradley and coach Jim Bradley. Riding the powerhouse battery of pitcher Brittney Bradley and catcher Ciceley Peavey, the Hailey U-14 fast-pitch softball team went undefeated to capture first place in the eight-team Top of the Tetons tournament June 24-25 at Driggs. The Hailey girls went undefeated in Friday's three pool-play games and took the top seed from its division into Saturday's tournament bracket. They swept the Minico Spartans and Idaho Falls Revenge to make the championship game. Wood River came out with its bats a-blazing and made few defensive errors in blitzing the Teton Terrors 15-4 in the finale. Outfielder Lacy Harrington ripped a homer to start off the championship game. The "nothing gets past us" outfield of Valeria Morse (center field), Lacy Harrington (left field) and Chloe Evans and Kenzie Sigglin (right field) was airtight. Pitcher Bradley and catcher Peavey put together numerous three-up and three-down innings, allowing only minimal stolen bases. They limited all the teams Wood River played at Driggs to four runs or fewer. Haley Cutler riding the batting cycle (homer, triple, double, single) against Minico; and an outstanding relay in the championship game from outfielder Lacy Harrington to third baseman Blair Radford to catcher Ciceley Peavey that cut down a potential Teton Terrors home run. It was Teton's only outfield hit of the title game and it came to naught. Sponsored by Power Engineers and organized under the auspices of the Wood River Baseball and Softball Association, the Hailey U-14s plan to attend the Idaho State Babe Ruth tournament July 7-9 in Jerome. They wrap up their season at the Bear Lake Slugfest in Montpelier July 29-30. Wood River (3-12) improved to 2-8 in Area C "A" West Division action Friday by splitting a hard-fought league doubleheader with the host Twin Falls Cowboys, in Twin Falls. Wood River out-hit Twin Falls 18-14 over two games. First baseman Marshall Reyburn smacked a three-run double sparking Wood River's six-run eighth that led to a 14-8 victory over the 'Pokes in extra innings. Hailey rallied from 5-1 and 7-3 deficits and used four pitchers to prevail. Collin Dean and Zach Israel hit triples. In the first game, Alex Padilla's two-run homer in the sixth enabled Wood River to tie the opener 4-4 after being behind 4-1 in the fourth inning. Righty Zach Israel held the 'Pokes to just six hits over six innings of strong pitching. Wood River is scheduled to resume action with back-to-back Founders Field twinbills Tuesday, July 5 against Skyline and Wednesday, July 6 against the Jerome Cyclones. Action starts at 3 p.m. each day.